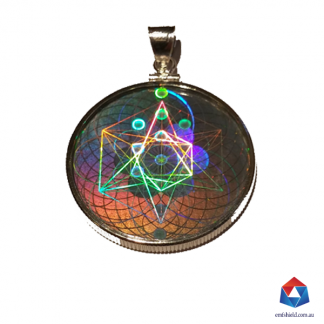 The EMF Shield Hologram Pendant Harmonizes electromagnetic radiation by projecting its coherent energetic field out up to a 19m radius. The Hologram Pendant contains our original and unique Sacred Geometric Hologram fused between glass surrounded by a Sterling Silver 92.5 frame. The EMF Shield Hologram Pendant has an amazing EMF harmonizing capacity by projecting its coherent energetic field out to a 19m* radius. This 30mm pendant has our Original and Unique EMF Shield Sacred Geometry Hologram fused between 2 glass sheets, surrounded by a sterling silver band. 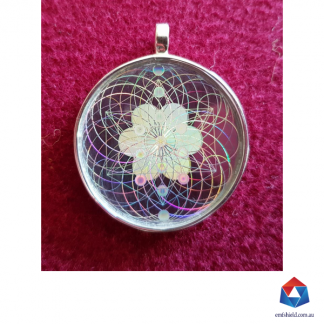 The EMF Shield Hologram Pendant contains a micro thin Holographic Film encoded with very specific creation codes of the Universe and Organic Biology. These codes continuously project an informational field of sacred geometry into your local environment harmonizing any scattered Electromagnetic fields, thus assisting all within this field. Its good to know you are protected! 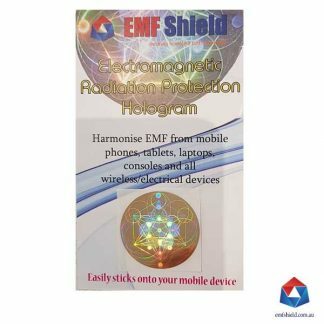 By wearing the EMF Shield Unity Pendant you significantly reduce the negative health impacts of electromagnetic radiation. In addition to the protection, and apart from the fact that it looks amazing, you are receiving huge health benefits on a physical, neurological, cellular and DNA level as the hologram continually communicates its Original Creation Codes to your entire being. It truly is the easiest way to harmonize your local environment. Wear it with confidence! 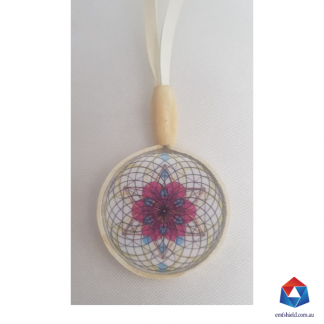 This pendant has glass components, treat with care to avoid scratches and breakage. Although the pendant is waterproof, it is recommended that you do not take your pendant into water (shower, pool, ocean). Sterling silver is an alloy containing metals that react with chemicals found in air and produce tarnish; high moisture levels, exposure to sunlight and contaminants such as salt water increase this reaction. Take steps to protect your sterling findings by keeping them in airtight packages, use tarnish-resistant products (such as tarnish tabs or strips) that absorb harmful chemicals, and store sterling findings in a cool, dry place. Most tarnish is easily removed by polishing with a mild abrasive or soaking in an anti-tarnish solution. I have tested the EMF Shield Unity Pendant and it offers exceptional protection to a large range of electromagnetic smog. This conclusion was formed from testing a number of individuals in close proximity to everyday electromagnetic output devices including phones, microwave ovens, computers etc. These devices work better for this purpose than anything I have tested before. I wanted to give you some feedback on the pendant that I now wear after Stewart bought his at the Eumundi markets in October. I got mine in late Nov when I said I would be traveling to the States for work, I wanted the pendant to offer protection from radiation at US airports. I started wearing and then got the strength to say to my employer I didn’t want to go on the trip! I’ve had an amazing experience in life since then and feel abundance flowing freely since that time. I am so grateful. I can remember telling you at the market that I was trying to fall pregnant and you said a baby would love the energy from the pendant. I focused my intention and I’m now pregnant! I had been trying to conceive for 8 months prior and fell pregnant on the next cycle. Oh, I just remembered something else – Stewart was focusing his attention on the pendant and rubbing it and told me he thought we should go to the area we have been looking to buy a house for the past 18 months as he thought the house for us was going to become available. The very next week, the exact house he had projected came on the market and we bought it. Both Stewart and I were wearing our pendants on Christmas day and my father decided he liked it and would like me to get him one too. He is very sensitive and finds the technological world overwhelming so I think it will be great for him. 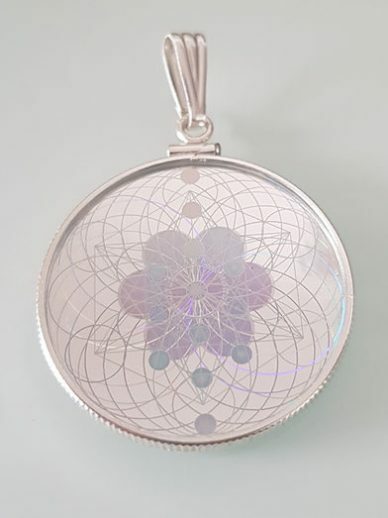 I purchased the holographic protective pendant about 6 weeks ago to wear as a protector as I live near many overhead power stations and I work on computers around 12 hours a day. And of course I’m exposed to the usual bombardment of EMF’s in my home, such as cell phones and Wi-Fi etc. I have been wearing the pendant day and night and have noticed that I have so much more energy and feel so much healthier. 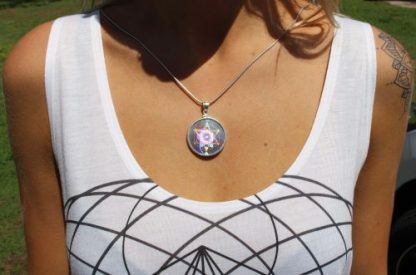 I am very sensitive to EMF’s and wearing the pendant has made a big difference to the way I feel on a day to day basis. Along with my daily exericse routine and a healthy diet, it completely satisfies my intention to take responsibility for my health and well-being and to keep my body-field (aura) protected at all times. Hi Matt I met you about a year ago and have since spoken to you on the phone to reorder some more products! I mentioned before that the Kinesiologist I see believes these products to be very effective at well over 90% protection and I feel a lot happier knowing these are in my home! We have since purchased more devices- laptop,tablet, gaming consol and a smart TV. Do you recommend we obtain a protection hologram for each extra device? Despite the wide shipping route, the article was… wonderful arrived within about 2 weeks. A very nice piece that I wear every day. My energy level has increased significantly since then. love it, a very cool necklace. This is amazing, simply amazing my life is out of control right now and only 1day into wearing I seem to feel better via placebo or necklace / not sure but either way it’s an amazing pendant I sincerely hope it does not break or fall apart for I want this around my neck for the rest of my life!, yah ! Thank you soooo much brotha from Australia! this is a wonderful pendant!!! sooo pretty!! and works well too!!! arrived in super fast time… Superb Seller and Shop!! Thank You Very Much. Shipping was fast and very reasonable. Item is as shown and described, very beautiful. As a bonus, people have commented on how beautiful it is. Thanks! After 2 weeks of use i feel as an empath that this is a great addition to anyone’s collection.. inc the great benefit of EMF protection.. it really does make a difference and i felt that right away. Thanks! Very beautiful pendent. My girlfriend loves it and it’s very elegant looking! Love this pendant 🙂 Thank you so very much! Glad I came across it! Absolute pleasure doing business with you 🙂 very satisfied customer! This is a beautiful piece and great company!! I LOVED IT!! Very powerful item! Works great!